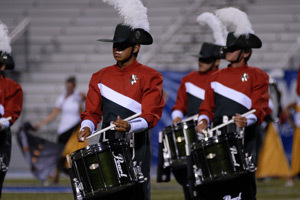 After spending most of the 2009 Drum Corps International Tour trailing Carolina Crown, Santa Clara Vanguard edged ahead to take second place (90.550) at the Pearl Presents the Masters of the Summer Music Games event in Murfreesboro, Tenn., Thursday, July 23. In third place, Crown scored 90.100 while the Cavaliers continued their upward climb from the DCI Southwestern Championship last weekend, taking first place at Middle Tennessee State University (MTSU) with a score of 91.600. Though happy with their performance, Cavaliers drum major Alex Harmon said, "Honestly, I think we have a lot more we can do to improve over the next two days. We'll make some changes and put some new things in, and continue to improve as we make our push into Atlanta on Saturday." 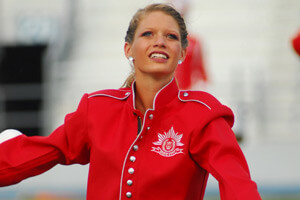 Santa Clara Vanguard drum major Stephanie Lee called her corps' second-place finish in Murfreesboro a "great surprise." "We certainly went out [tonight] to have the best show we could, and we're glad that the judges felt that it was in a certain place," she said. Santa Clara Vanguard drum major Stephanie Lee. 2009 is shaping up to be a banner season for the Vanguard, and CEO Jeff Fiedler said that while members of the organization are proud of this season's achievements, they are not ready to rest on their laurels. "The corps hasn't been at this level in a few years and it's pretty exciting for us," he said. Fiedler said that everyone involved with the corps' 2009 production has been asked to step it up this year. "Right now, we're enjoying the benefits of a very strong winter and preseason approach to rehearsal. Our goal was to be prepared." Also performing in Murfreesboro on Thursday night: Blue Stars took fourth place with a score of 85.150, followed by Blue Knights (5th, 83.450), Troopers (6th, 80.050), Colts (7th, 78.950), Spirit (8th, 77.150), Madison Scouts (9th, 77.100), and Pacific Crest (10th, 73.550). Brand new to the World Class this year, Jersey Surf made an impression on the crowd at MTSU's Floyd Stadium finishing in 11th place with a score of 70.750 during their first DCI Tour appearance since July 6 in Jackson, N.J. The Camden County, New Jersey-based corps operates with a modified schedule that allows members to continue with their other summer plans and obligations such as work and summer school, while still providing a world-class drum corps experience. The Surf is now on the road full-time for the final circuit of the 2009 Tour, and members believe that everyone in the corps has kicked it up a few notches as expectations for them rise to a "World Class" level. "It's a lot harder this year, but I think we're all taking that jump together," said color guard captain Stephanie Broadbelt who is a fourth-year member of the corps. "But, it's the same Surf; it's always going to be the same Jersey Surf." Also in Murfreesboro, Drum Corps International's new kids on the Open Class block, Music City, of Nashville, Tenn., had a strong showing for a hometown crowd. "It's a young group," drum major Wes King said. "Most of the corps members are just graduating from high school. But the amount of work we're asking of them is amazing. It's a great product they've put out after only a few days of rehearsal." Chelsea Blackburn, a color guard member with Music City, was sidelined after an injury she sustained in rehearsal this week. She was unable to perform with the corps on Thursday. "I would have given anything to be out there with them. I'm so proud of what they've done, even in the past 24 hours. I wouldn't be anywhere else but here." While all corps are preparing for upcoming competitions with a laser focus, members and their staffs are taking things one day at a time. "We try hard to not make any one show a bigger deal than the rest of our shows because we strive to have a fantastic performance every night," said Colts sixth-year member, Andy Tobin. And each corps will undoubtedly continue to put it all out on the field for every rehearsal and performance hereafter. The level focus of each corps member will only be heightened as the corps begin the final stretch of their race to the World Championships in Indianapolis this August. View a complete recap of scores from the Pearl Presents the Masters of the Music Games event.